My realization: it’s my of lack focus, my lack of creative motivation… which all stems from: my lack of time. I’ve tried setting dates to start writing. Thanksgiving: the day I’d write about how thankful I am for all the people I’ve met; New Years: what better excuseÂ to start something new… and even Lent: though I am not Catholic, I thought I’d give up procrastination and start writing. So much for that! Whether it’s long hours at the office, errands we must run or events we must attend: whatever, there’s always an excuse not to start something. You know it, I know it, we are all guilty of it. Today is March 8, 2013. It’s not a special day, just a Saturday. I happen to live in Denver, CO. It happens to be snowing. And I decided it was time to write. How many times have you said to yourself, “Today is the day that I am going to start______ ” (you fill in the blank). Think about it, how many friends do you intend to call, instruments you prmise to practice, dinners you wish you could have shared, trips you hoped to have taken. Or maybe it’s time to finish reading a book, fix a bike or learn a language. Whatever you choose, it takes Time. Time and I have a love/hate relationship. Some days I can’t get enough of an unplanned day that takes me from one adventure to another! Other days I can’t find enough hours to get my basic To-Do list complete. Then there’s a day like today, where I thank Time for offering me the choice of what I want to do with it. But… did Time give this gift to me or did I give this gift to myself? Time is not only valuable, it’s tangible, too. Though we can’t touch it, we sure an measure it. Just ask the guy that got 4th in any Olympic Event. Every second can be life changing! Think of seconds like pennies. We need them, but we don’t typically count them towards our total.Â But how silly is that. Without 60 seconds we wouldn’t value a minute and without 1440 minutes, we would not have 24 hours in a day. Thinking like that, I feel rich- with time! 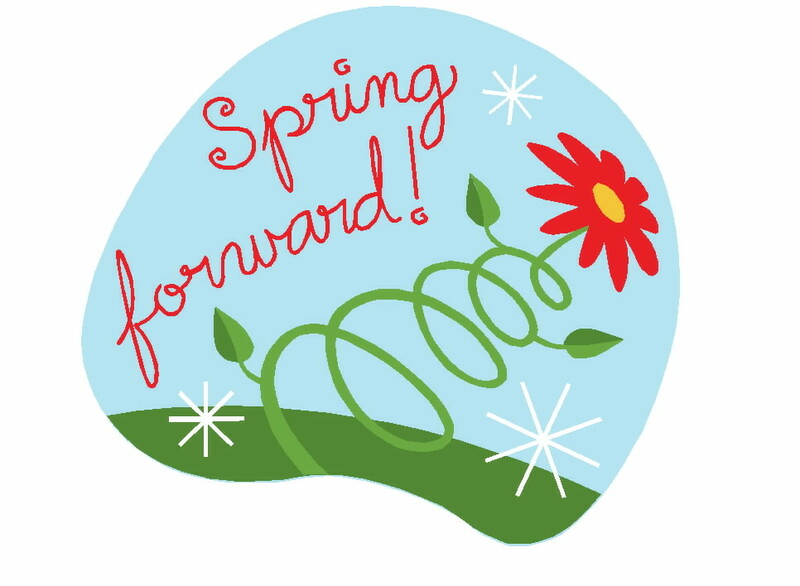 At 2 am tomorrow morning, we Spring Forward! Personally, I’ve been counting down the days since November 3, 2012– the day someone decided to rob me of my hour of day light. Words can’t express how excited I am for sunshine on my drive home from work. However, I wouldn’t be fair if I didn’t say that we are technically “loosing” an hour of our precious time. Just like that– time is taken away from us. See… time really is something we don’t know we have until it is gone. Â I read a quote the other day that made me think, â€œYou are younger today than you ever will be again. Make use of it for the sake of tomorrow.â€Â Holy cow, reading this at this very moment, YOU are the youngest you will ever be! You know what that means, there is no time like now to start something new. Even if this “something new” feels like a worn out promise to yourself. I’ve said over and over that I would write a blog post– but with so many stories that I’ve written in my mind since 10/19/2012, I didn’t know where to begin. I’ve been spending so much time worrying about what to write about rather than simply sitting down and writing. Today, I gave myself the gift of time. An hour. To write what you are reading now. The point of this post is to inspire you to take charge of what little time you may have.Â I hope this serves as a reminder that TIME IS ON YOUR SIDE- it is simply what we choose to do with it. I could not have planned “oh at 4:30 on Saturday, March 8, 2013 I will finally write my next piece”. Nope, no way. I simply choose to spend a little quality time with Time today. I hope you can find the time to start doing whatever you keep putting off today, too. The second inspiring message I have received today. I think someone up there is telling me it is time for a change. If I didn’t allow myself time away from homework one evening to watch a basketball game, I would have never had the opportunity to experience the perfect timing of meeting you! It’s true! Considering you can’t see it, time is a very real tangible thing!Just a five years ago, feeling less directed than I feel today, I used to cherish the chance to have L.O.T. ( the LUXURY of time), to savor the indulgance, until I was given “a charge” to make the most of the hours in the day. I am so thankful that I found my way to making that a part of my every day life. It happened because I realized that there IS no time like the present and made a personal decision to leverage the opportunity. Carlyn, here’s to you finding YOUR personal balance to make all YOUR dreams come true. Mommy loves YOU! Today is the day I am going to get my act together (I hope). Great post, Carlyn! Made me think about time and habits and the legacies we are leaving.